​Last year, the Wolf Administration took important steps to strengthen the fight against invasive species in Pennsylvania. 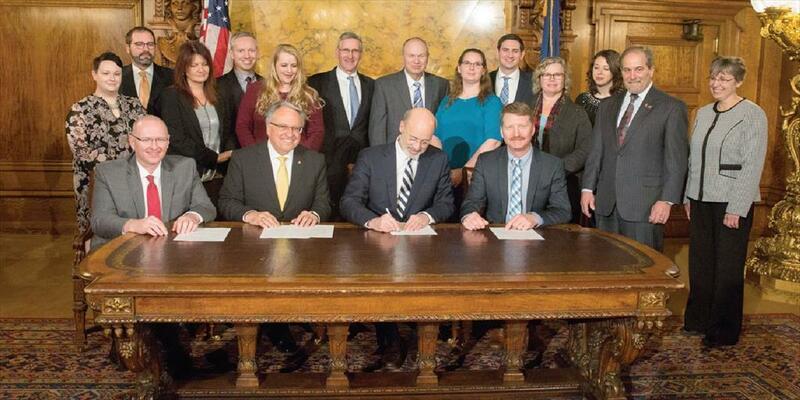 In October, Governor Tom Wolf signed Act 46, the Controlled Plants and Noxious Weeds law, into order. And in December, he signed a new executive order expanding the Governor’s Invasive Species Council​ to bring additional expertise and resources to protect the commonwealth from new, threatening species. Act 46 repeals the previous noxious weed law in favor of a more proactive approach to control existing and potentially noxious weeds, while maximizing resources to control invasive species and protect Commonwealth lands. At the same time, the new law will allow for the cultivation of some controlled plants that have beneficial characteristics or offer economic value. What does the new Controlled Plant & Noxious Weeds Law mean for Pennsylvanians? Invasive and noxious weeds are a serious threat to Pennsylvania. The law will protect the waters, forests, agricultural lands and other natural treasures that are known to the commonwealth. It will build industry. Some plants deemed invasive or noxious have potential for use as biofuel and biomass production. The new law acknowledges these useful traits and allows their growth, with proper permits, in the state. Farmers will benefit and crops will prosper. Farmers will be better informed about new weed threats to their crops that could harm the profitability of their operations. The Governor’s Invasive Species Council is a multi-agency advisory panel, comprised of seven state agencies and non-governmental agencies with a common purpose of identifying invasive species that could threaten the commonwealth’s natural and agricultural resources. The council was initially created by executive order in 2004, but Governor Wolf’s revised order in December 2017 expands the council’s membership to enlist more stakeholders in the work to protect Pennsylvania’s agricultural and natural resources. It also will allow state agencies and stakeholders to better coordinate resources, which will allow the council to develop plans, engage with partners, and implement response strategies for threats more effectively.